Low carb diets have been popular on and off since the dawn of the Atkins fame (and maybe even earlier?). But, what exactly defines low carb? Does eating this way actually help with weight loss? Are there any other health benefits (or risks) to eating fewer carbs? 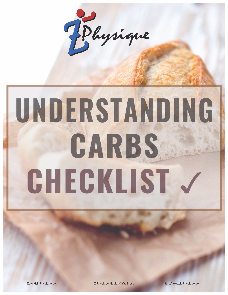 A carb, or carbohydrate, is one of our three main macronutrients. Carbs, along with protein and fat that are needed for optimal health in quantities larger than vitamins and minerals which are micronutrients. Sugars are the smallest (molecule) carb. There are many different kinds of sugars, beyond the well-known table sugar (sucrose) or fruit sugar (fructose). Starches are longer chains of many sugars bound together. Starches are broken down by our digestive enzymes into sugars. These sugars are then absorbed and metabolized in much the same way as if we ate sugar itself. Fibre, on the other hand, is also a long chain of sugars, but these are not broken down by our digestive enzymes. Fibre passes through our system, feeds our friendly gut bacteria, and then takes food waste out the other end. Because fibre isn’t digested like sugars and starches, it’s often excluded from the carb calculation. When we eat carbs, our body absorbs the broken down sugar into our blood, thus raising our blood sugar. Depending on how high and fast our blood sugar rises, our body may release insulin to tell our cells to absorb that sugar out of our blood and use it as energy now or store it for later. This is part of the theory as to why eating low carb diets may help with weight loss – by preventing the release of insulin, thus preventing the storage of excess calories. But, our bodies are a bit more complicated than that! Low carb for weight loss? A few studies recently put low carb diets head-to-head against low-fat diets for weight loss. 1 – There isn’t one universal definition of low carb (see the next section below). 2 – It’s more difficult for people to stick to low carb diets than low-fat diets. 3 – Both diets work for some people, and neither one is overwhelmingly better for weight loss than the other. 4 – The number of calories people eat is still considered a huge factor when it comes to weight loss success – more than whether the calories are from carbs or fat. There isn’t one single definition. The average American eats about 300 g of carbs per day. Some people consider eating under 250 g of carbs per day to be the first threshold of a low carb diet. That’s really not that low in carbs, it’s lower carb, rather than low carb. Plus, if you’re new to cutting carbs, this level is easy to maintain and a good start (if you want to cut your carbs). Taking that a step further, eating less than 150 g per day of carbs is considered a typical low carb diet. On the extreme side, eating less than 50 g of carbs per day is considered to be very low carb – it falls under the ketogenic diet range. Eating so few carbs can actually change your metabolism into a ketogenic state. Eating this way can be difficult for many people to maintain. Low carb diets have the benefit of preserving muscle mass during weight loss. They can also improve heart health biomarkers like cholesterol and triglyceride levels. Not to mention that eating fewer carbs can improve how our bodies manage those carbs in terms of insulin and fasting blood sugar levels. There can definitely be some non-weight-loss health benefits to eating fewer carbs! Eating a low carb diet can be healthy, as long as it contains enough of all the essential nutrients. Some people may lose weight eating fewer carbs, and others won’t. Low carb diets can help to improve how the body manages blood lipids and blood sugar, so it can be a healthy choice for some people. As with most things in nutrition, there isn’t a one size fits all rule. Low carb diets can be a good choice for many people, but it’s not the magic bullet that some people claim. What about you – have you tried (or do you currently) eat low carb? How many carbs do you eat per day? Have you had any great (or not so great) health effects from it? Let me know in the comments below. Cover a large baking dish with parchment paper. In large food storage bag, combine all ingredients except chicken. Place a couple of pieces of chicken in the bag and shake until coated. Place chicken on a lined dish and bake uncovered for 20 minutes. Turn over and bake 15 minutes longer. Ensure internal temperature of chicken reaches 165F. Tip: You can roast veggies in another pan at the same time. Just chop, drizzle with oil, and sprinkle with salt and pepper. They might not need to cook as long as the chicken, so check them periodically.